Nora Aunor, covers StarStudio Magazine - September Issue! 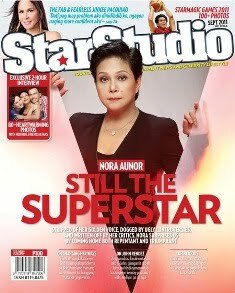 Check out Nora Aunor on the cover of StarStudio Magazine for its September issue. This is the story that everyone has been waiting for: Superstar Nora Aunor returns to Manila! and the pages of StarStudio Magazine in a tribute that features more than 80 intimate photographs of her with her fans, friends and family and portraits by Master Photographer Jun de Leon. In a one-on-one interview, Nora revisits the years she spent in the US, her humble beginnings back in Bicol, her rise to fame, being reunited with her family and what she faces now as she stages a comeback via the film “El Presidente” and a forthcoming TV project. The September issue of StarStudio also brings you photos from the StarMagic Games. Re-live the action, color and drama of the games pitting your favorite StarMagic artists against each other in friendly athletic competition. The issue is packed with other features on beauty, fashion and celebrity lifestyle. StarStudio is brought to you by ABS-CBN Publishing. Get your copy of StarStudio Magazine’s August 2011 issue now. For more information follow @StarStudioMag on Twitter, or Facebook account: http://www.facebook.com/StarStudio.Magazine.